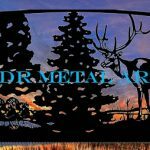 Driveway Gates Washington | Custom Plasma Cut Bear & Moose Design - Custom Driveway Gates - Iron Steel & Aluminum - JDR Metal Art - FREE Standard Shipping! We worked with a client from the state of Washington to design these ornamental driveway gates. The design theme features a bear and a moose in a background that reflects the client’s locale. If you look closely you can see that the gates are hung from steel posts placed directly behind a magnificent overhead entryway that features bears carved from wood! Each driveway gate panel is 11′ wide for a total gate width of 22′. The panels weigh approximately 325 lbs. per side. We used heavy wall 7 ga. tubing for the frames so there is plenty of structural support to easily withstand winds and the forces of being repeatedly opened and closed by automated gate openers. The driveway gate silhouettes are cut from 11ga. sheet. The gates and posts were pretreated and then powder coated black multiple times to build a nice thick rust preventing barrier between the steel and the Washington environment. 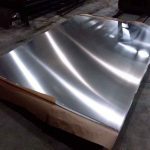 At JDR Metal Art driveway gates, not only do we build our driveway gates to last, we design and build them in a way that allows us to provide a beautiful artistic driveway gate at or lower than the cost of our competitors who simply provide plain looking gates mass produced in either Mexico or China. Why settle for less from them when you can get more from us? We are proud to provide our customers with metal art gates handcrafted in the USA! We enjoy working with people from all walks of life in order to help them create a gate that will make a lasting statement about who they are and what they stand for. It is an honor and a privilege to be given such an opportunity on an everyday basis. It is a challenge that we don’t take lightly. We are receptive to the many factors that go into bringing out the full design potential in each customer’s driveway gate design process. We ship most of our custom made driveway gates via motor freight. They are crated up and shipped from our fabrication and powder coating facility in Columbus, Ohio to the final destination. The gates can be shipped directly to your residence, to a local business, or picked up from a local freight terminal.